The Sin Bin Sports Blog: Can Lidstrom Continue To Be An Elite Defender In The NHL? Can Lidstrom Continue To Be An Elite Defender In The NHL? Nicklas LIdstrom, the 41 year old Swede, has been the picture of the ideal defense man. Since coming into the league in 1991 he has played in 1,494 games, scored 253 goals and recorded 1,108 points. He has never missed the playoffs and has lifted the Stanley Cup four times. However, at the conclusion of the Red Wings' 2010-2011 season one major question floated over the organization. Did they just witness the last time, Lidstrom would be wearing a Red Wings jersey? To the relief of the Wings' faithful, Lidstrom announced that he would in fact return for his 20th season in the NHL, when he signed a one year contract worth $6.2 million. However, with that question answered another question rushed to the fore front. 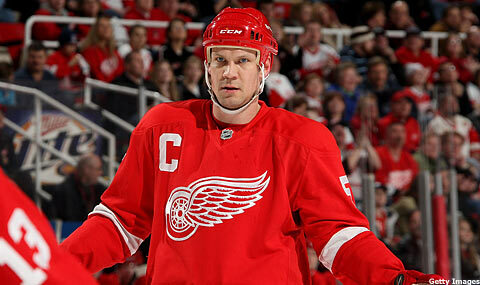 Does Lidstrom have enough left in the tank to return to the NHL and continue to be one of the leagues top defense man? A look at the kind of season Lidstrom had last year should put that question to rest. Lidstrom was the second highest scoring defense man in the league, behind only Lubomir Visnovski of the Anaheim Ducks, after he scored 16 goals, three coming in his first career hat-trick, and 46 assists on his way to 62 total points. Once in the playoffs, for the 19th consecutive season, Lidstrom recorded eight points in 11 games.I don't think those numbers are the numbers of a player who is slowing done. Along with his statistical performance Lidstrom won his seventh Norris Trophy, which is given annually to the league's top defense man. Even if Lidstrom does not produce numbers like he has in the past Lidstrom has won four Stanley Cup Championships, is a 12 time All Star, Olympic Gold Medalist, and a Conn Smythe Trophy Winner. Tell me you wouldn't want a guy like that in your locker room for as long as possible. Likely at the end of the 2011-2012 season the question, will Lidstrom hang up the skates for good, will once again appear. 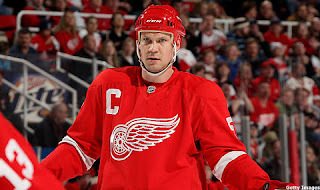 If Lidstrom does decide to retire the game will be losing one if its all time greats, but if he wants to give it another go, the Red Wings and NHL will welcome him back with open arms.